Why not spare yourself the hassle this year — use a Deliverator to send out your gifts and invitations for you! Just give it the item to deliver, fill the notecard with the names of everyone you want to deliver to, and off it goes! It does the boring part, so you can just curl up by the prim fireplace and enjoy the holiday season! 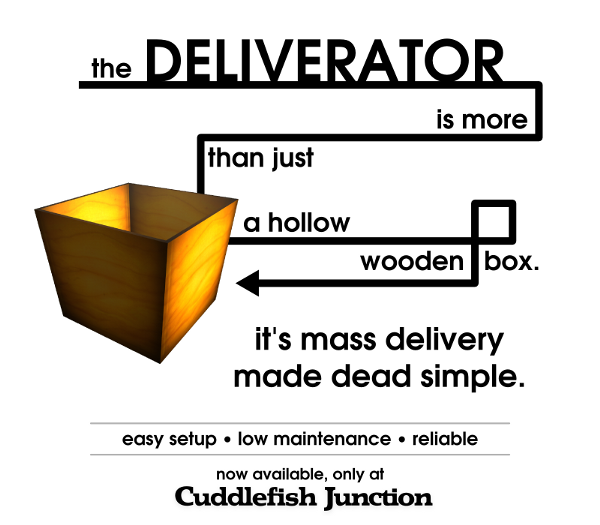 The Deliverator is available at Cuddlefish Junction for just L$500. And it’s transferable, so you can let a friend borrow it, and save them from the tedium, too!